Kenilworth Lions have recently made an award of £1,000 from their 2019 Dream Scheme programme to support the Hospice At Home service run by The Shakespeare Hospice. The service includes personal, nursing care, support and advice at home to local people affected by life limiting illnesses, provided by a team of registered nurses and healthcare assistants, 24 hours a day and 7 days a week. The award will support approximately 74 visits to patients in the Kenilworth area in the coming year. The Dream Scheme initiative was launched by Kenilworth Lions earlier this year, as part of their 50th Anniversary celebrations throughout 2019. 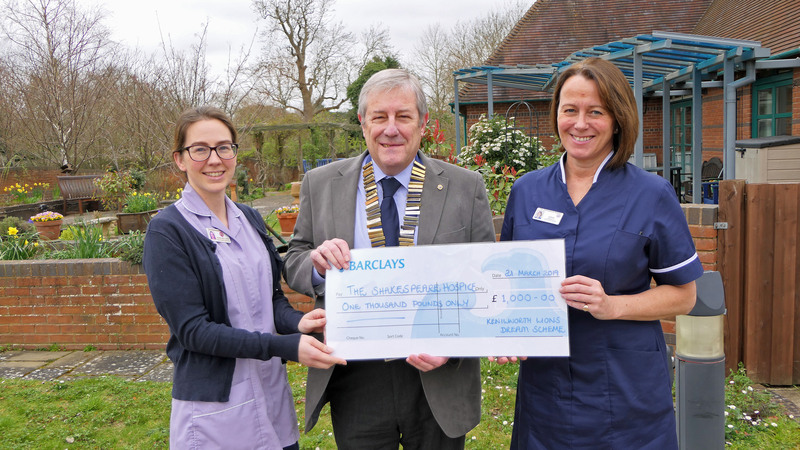 Kenilworth Lions’ President Gordon Henderson presents a cheque to Jenna Mellings – Health Care Assistant & Sarah Duncan Hospice at Home Team leader of The Shakespeare Hospice.